... on the lower rim of an archtop, now that I stood up while standing on the cord and cracked the wood a little? It's not broken out, just a single short "finish crack" radiating from one side - but it's a bit wobbly when I wiggle the plug, so I assume that crack goes through the wood. And/or oversize washers both inside and out? One-a-them squarish plates that goes on with four screws? Any magic new fixes for this age-old issue? The new Players Editions have metal jackplates. Good repair guys & gals know what to do; I'd be guessing. 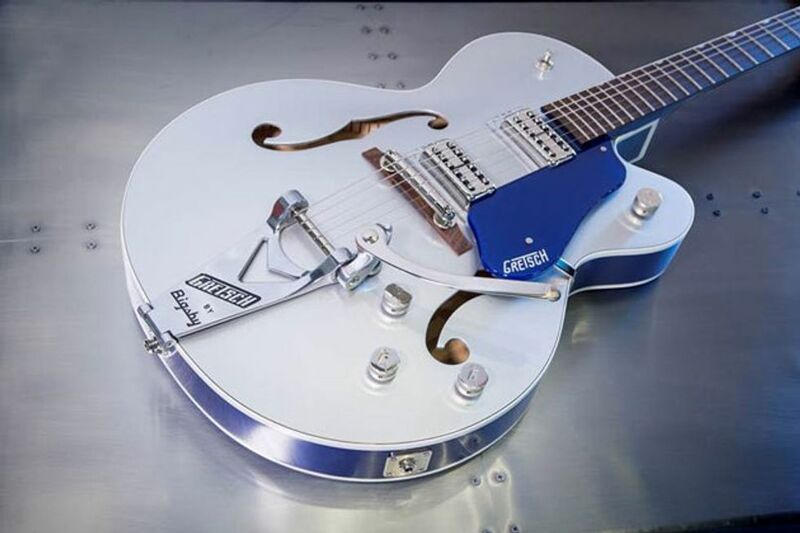 The idea of putting some kind of jack plate on all my Gretsches has been floating around for a while; think I'll just do it the next time I send one off to the shop. Of course the question still ramains; what type? And, just an opinion, but almost all guitar cables should have a 90 degree angled jack on one end. This serves as reinforcement for the damaged area. However, it also adds to the thickness of the area and, since some jacks have short threads, you may find yourself replacing the jack as well. Cyanoacrylate adhesive superglue comes in various viscosities, you'll want the thin stuff. Use a toothpick and carefully allow it to wick in the crack.Tape around the crack helps errant drips,but wipe clean immediately or you'll glue the tape in place. Compress the crack and give it a minute to set. If it were mine, I would probably go ahead and add the metal jackplate as extra insurance. I wonder if the jackplate on the Players' Editions is unique in design by comparison to the AllParts. Not that it matters much, I guess. The AllParts is pretty handsome. I assume it comes in gold. I'll be careful with the SuperGlue. My wife just glued a cracked ceramic bowl to the glass top of our coffee table. "It said to lay it so gravity pulled the glue into the crack," she said. That doesn't explain how she ended up with a square-inch pad of superglue 1/8" thick. The instructions always say one or two drops per inch. I don't know if her inches are bigger than mine, or her drops. Had to chisel it off. I've tried to use superglue to drop-and-fill some guitar finishes, with less than perfect success...but I can handle this. Especially since it will be covered with a plate anyway. I don't think a 90° plug would have helped in this situation. The jack outer diameters are pretty standard, so if you have enough threads the only adjustment that might be required is to match the curvature of the plate to the curvature of the body. I generally handle this through the precision method of placing it on the bench and leaning on it, as they usually need less curve rather than more. It does indeed come in gold, and many other colors and materials, and I find that the 1 inch hole spacing for the attaching screws is the perfect size for just about any application. Most often there is a reinforcing block of some sort inside the body at the jack, and the screws will have some extra wood to bite into. It's been a while since I purchased any of these from AllParts, as I tend to buy such things in batches. They used to come with screws, but if not they are available there as well. That's the only way I'd do it, those big jack plates just look like a bodge. Avoid squaresville daddy-o, get the ellipse from allparts. Some might say aesthetics are pointless here, but this takes utilitarianism to new levels of bling. Didn't this happen once before, back around 10 years ago? Geez man - to me? I don't remember! What did I do then? Tarvo, I saw them ellipticums. Looked good to me too. +1. Although, I guess it depends on the guitar. If it's a beater that I know will continue to be beat, then maybe a jackplate. If it’s good enough for Gretsch, it’s good enough for me. Maybe jack plates will become standard someday. Yes, I like the idea of reinforcement inside. Alas, no luthiers in this area - and it's not worth a round-trip ticket to ship somewhere. I'm not interested in working through the pickup hole to try a fix myself. On some guitars, it would be worth it. This is far from a beater - it's pristine - but it's not going to be a main ride, either. Jack plate is perfectly appropriate here. I've done the "large thinnish washer inside the guitar" trick before, and it has held for 15 years. For added benefit, I slathered the washer with titebond before I reassembled the jack through the hole. I slathered the washer with titebond before I reassembled the jack through the hole. Slathering. That's something I can do. I can slather. Means taking the bridge and jack out...and resoldering the jack, but oK. Sounds like an excellent compromise good-enough fix. Yessir, I'll bet you can pre-radius it pretty close to the inside curvature with a hammer and a rock. Thats how we do in Illinois, leastways. I agree with the reinforcement idea, didn't mention it as I made the assumption that it takes a bit more patience and know how,but it can certainly be done. Y’know...combining the notions of a jack plate, pre-bending same to fit, and slathering...why wouldn’t one take out the jack, bend and slather, then put the plate on the INSIDE of the guitar when fishing the jack back through the hole? With a big washer for pressure behind it and the usual nut (with a slightly oversized washer) on the outside, wouldn’t it snug up, set up, and provide all the desired rigidity without compromising the appearance of the guitar? "without compromising the appearance of the guitar?" I want one for my Hot Rod.